OSSSC recruitment 2019. Online application will be starts from 29-12-2018 and last date for this OSSSC Vacancies Recruitment of Junior Clerk jobs is 29-01-2019. Selection for these OSSSC Junior Clerk Jobs Recruitment is through Written Test and Practical Skill Test (Basic Computer Skills & Essay, Letter writing in Odia) only. Candidates who qualified 10+2 and having within the age limits of OSSSC they can apply online for this Junior Clerk Jobs through OSSSC website of www.OSSSC.gov.in. Both Male and female candidates can for these OSSSC Junior Clerk Jobs before the closing itself. 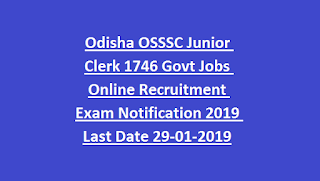 For more information related to this OSSSC Junior Clerk vacancies recruitment Exam Pattern, Exam Syllabus, Selection Procedure, application registration procedure and more info is given below. For this OSSSC Recruitment 10+2 qualification is required and must have basic computer Skills. The candidate's age limits cutoff date is 01-04-2018 is 18-32 Years. For SC/ST/SEBC/Women candidates 5 years of upper age relaxation is given and for PH candidates up to 10 years of age relaxation will given. OSSSC Junior Clerk jobs written test consist of two papers and written test will be conducted for 385 Marks. Candidates who are qualified in Written Exam they are only eligible for OSSSC Practical Skill Test. Application fee is Rs.100 for Gen/SEBC candidates and for other no examination fee. Candidates can pay the fee online using debit card or net banking. Online applications will be received through OSSSC website of www.osssc.gov.in. It is mandatory to Register online and then apply for the Junior Clerk Post. Before applying read the notification of OSSSC Junior Clerk Recruitment without fail. 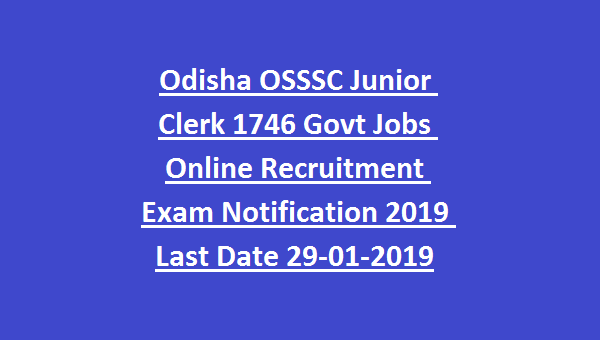 Click here to apply online for the ODISHA OSSSC Junior Clerk Jobs Recruitment 2019. Additional poss are added for SC/ST candidates.